An graphic rendition of how what a small modular reactor might look like. An energy consortium of which the city of Idaho Falls is a member has moved one step closer toward building a nuclear small modular reactor on the desert west of Idaho Falls by 2025. The U.S. Department of Energy announced Thursday that an agreement has been reached to support possible siting of an SMR project within the boundaries of its 900-square mile Idaho National Laboratory site, the home of 52 reactors between the 1950s and 1980s. A site use permit has been granted to the Utah Associated Municipal Power Systems, of which Idaho Falls Power is a member, allowing UAMPS access to the INL site to analyze environmental, safety, and siting conditions for its Carbon Free Power Project. If UAMPS identifies a suitable area for the project within the INL site boundary, and if the Energy Department determines it would not conflict with INL mission work, the design, construction and operation would be licensed and inspected by the U.S. Nuclear Regulatory Commission, following extensive safety and environmental reviews. The design for the project is being provided by NuScale Power, a Portland, Ore., company that announced its interest in Idaho in the fall of 2012. A subsidiary of Fluor, NuScale was picked in 2013 as winner of the second round of the DOE's competitively-bid, cost-sharing program to develop SMR technology. 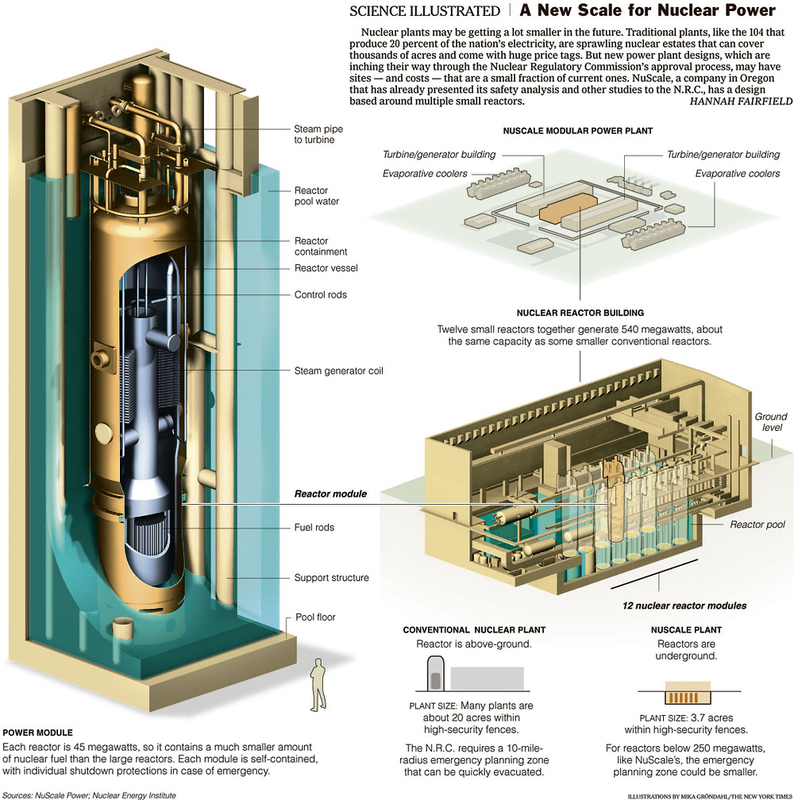 The regulatory hurdles are formidable and the permitting process alone will cost $1 billion, said Michael McGough, chief commercial officer for NuScale, in a 2012 interview. NuScale has had a prototype small modular reactor in operation since 2003. Fluor wants to market nuclear power plants to the world, which is why it bought NuScale in October 2011. In December 2015 the company announced it had signed a contract with AREVA Inc. for the manufacture of SMR fuel assemblies. Mechanical and thermal hydraulic testing of the new fuel assemblies is under way as part of NuScale’s design certification application, which is planned for submission to the U.S. Nuclear Regulatory Commission late this year. McGough said review of that application would take 39 months, after which they need to get NRC permission to build. "There's lots of things you have to do, and you have to do them right," McGough said. Unlike traditional pressurized water reactors, which use electric pumps to keep water on fuel rods to keep them from melting, NuScale's self-contained, self-circulating reactors are designed to shut themselves down in a power failure. The Western Governor's Association has had nuclear energy on its mind since 2012, when it released its "State of Energy in the West" report. One of the stated goals was to find ways to accelerate introduction of small modular reactors into Western states. Shortly after that, NuScale announced its Western Initiative for Nuclear, a demonstration project in Idaho to be built and owned by a consortium of regional utilities including Energy Northwest and UAMPS. "The electrical industry is changing – that change is driven in part by regulations and technology," said Idaho Falls Power’s general manager, Jackie Flowers (who was also elected UAMPS chairwoman this past December). "The opportunity to participate on a project that is leading the evolution of the nuclear energy industry is exciting. And the opportunity to evaluate siting potential at the country’s lead nuclear laboratory is thrilling."